I happened to be visiting Washington D.C. at the same time as the National Cherry Blossom Festival last weekend. Although I couldn't make it to the Tidal Basin to dance under the pink Yoshino cherry trees, I did swoon over several other beautiful blossoms. The tulip-shaped petals on the pretty pink magnolia tree above were my favorite. And if you follow me on Instagram, you already know how tickled pink I was to spy a giant Care Bear balloon lining up for the parade. I love magnolia! But these purple, pink ones are my favorites. Great shot. Magnolia Trees are so pretty! I miss the big ones in Savannah, GA. In Nebraska they are dwarf sized. What an amazing photo! Just beautiful! Oh that's beautiful! Managed to catch the Sakuras blooming while I was back in Japan. Really happy! Those flowers are so beautiful. Your photos are so terrific. You should enter them on a site to earn money. The sunlight on the magnolia is gorgeous! 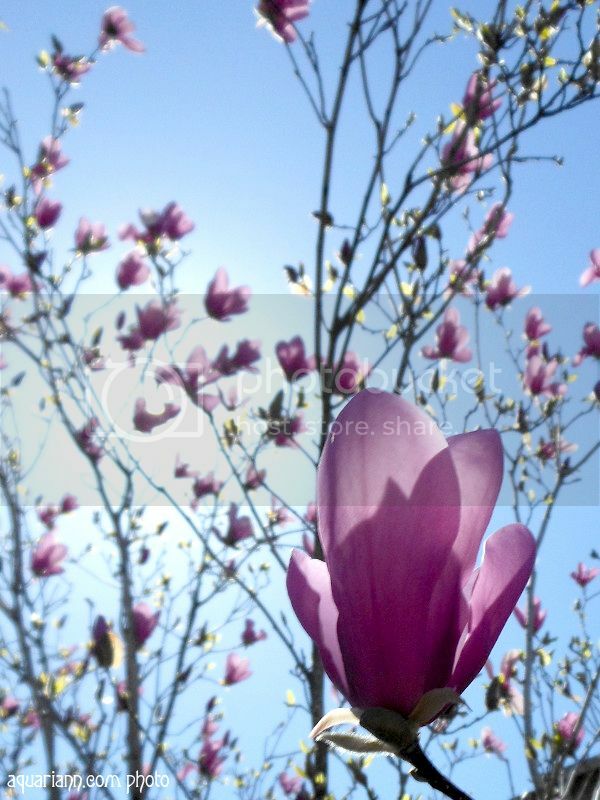 I've never thought magnolias were that pretty, but your photo made me change my mind. Beautiful! The magnolias are so lovely! I grew up outside of Washington, so I did get to see the cherry blossoms a few times. So beautiful. Would love to see this tree. Spring blossoms are the best! What a lovely angle! Love the sun bathing the blossoms with light! Beautiful flowers, they look like silk! What gorgeous photography. My #WordlessWednesday is on the cherry blossoms around the Tidal Basin in DC. It looks like you saw beautiful splendor regardless. Have a great day! Your shot is absolutely fantastic! Wonderful, i like the color ! The magnolia is great set in scene . Beautiful! I'm such a sucker for flower shots. So pretty! I heard the cherry blossom festival was amazing, wish I could've been there to see it! Just beautiful!! I cannot wait to see flowers blooming again!